Central America: Atlantic slope from the Ulua River (Honduras) to the Matina River (Costa Rica). As with most Cichlids sexing is a problem, most people agreeing that the best visual guide to sexing jaguars is that the male will eventually lose the thick black band running laterally down their body whereas the female will not. In their mature state, the male will have a body full of spots while the female will still have the black lateral bar. Theoretically compatible with any aggressive American Cichlid, until large enough to eat them, however please note that in the wild this fish is known to kill and eat other fish up to and including its size, for this reason a species tank best suits this Cichlid. Even when only a male and female are in the tank, the males are known to injure and sometimes kill the female. Will accept most foods including live/frozen foods such as bloodworm, shrimp, krill and earthworms. Will eat small fish but store-bought feeder fish and especially goldfish are not recommended. Readily accept pellet foods, but tend to be messy eaters. A large and well filtered tank is ideal with dimmed lighting and plenty of hiding places provided in bogwood and branches. 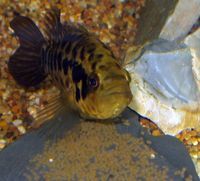 A large and aggressive Cichlid, best in a species tank for this reason. Longer than average body and very large mouth for an American Cichlid. Vertical dark brown/bronze-gold stripes when young, turns to dark bars and iridescent speckling when older. This page was last edited on 23 January 2018, at 23:43.